The GainSaver refurbished Mid 2012 Macbook Pro has everything you need to handle the most demanding applications at a very affordable price. This Macbook Pro gives you a breathtaking Retina display, flash drive storage, Quad Core i7 processor and two Thunderbolt ports for high speed connections to your peripherals. Your low GainSaver price includes a 30 Day Money Back Guarantee, so you really cant go wrong with this refurbished Macbook Pro deal! The Retina display on this 15.4-inch used Macbook Pro provides an amazingly clear and crisp picture with its 2880-by-1800 resolution. It also incorporates IPS technology, which allows you to view the screen from just about any angle without losing clarity or brightness. The refurbished Mid 2012 Macbook Pro was the first Macbook Pro to have the Retina display. If you are looking for a great deal on a cheap used 15.4-inch Macbook Pro, and the Retina display is a must have feature for you, then this is system is probably your best choice for price and performance. As for speed, this used Macbook Pro has it! The GainSaver refurbished Mid 2012 Macbook Pro runs on a Quad Core i7 processor at 2.3GHz. This system is truly a mobile powerhouse. The Intel processor supports Hyper-Threading technology that allows two threads to run simultaneously in each core. Its perfect for running your most demanding applications, like Aperture and Final Cut Pro. 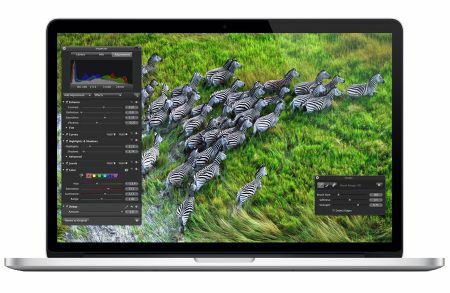 Whatever your needs, from scientific modeling to video creation, this refurbished Macbook Pro is up to the task. For even faster performance, this used Macbook Pro has no old fashioned hard drive to slow you down. It incorporates a high speed flash drive. The flash drive has no moving parts. It works just like regular memory, except that you can turn off your refurbished Macbook Pro without losing your files. In fact, the flash drive is not only faster and lighter, it is less likely to fail than a regular hard drive. When you purchase your refurbished Mid 2012 Macbook Pro from GainSaver, you can have it customized by GainSaver technicians. It already has a high speed flash drive, but you can have it upgraded to a much higher capacity flash drive. That way, youll have room for all your movies, photos, data files and application programs. Just open the Hard Drive menu to see the available flash drive options. After you upgrade the flash drive and finish with the Configurator options, click the Buy Now button to check out.